On October 20, I attended the 21st Annual Great Plains Alliance for Computers & Writing pre-conference event entitled “Exploring Embodied Technologies: Interdisciplinary Collaborative Workshop,” held at the University of Minnesota, St. Paul. Hosted and organized by the Interdisciplinary Collaborative Workshop faculty and the Wearables Research Collaboratory, the sessions enabled participants to “experience multiple studio spaces as a means to explore the intersections and juxtapositions of embodied technologies as studied across multiple disciplines that include art, science and engineering, design, education, and composition and technical communication” (Pre-Conference Program). In the spirit of discovery and inquiry, in the following, I venture into each of the studio spaces and reflect upon the insights gained from the workshops. What does it mean to “technologize” ourselves through immersive and embodied devices? How does each of us understand, define, and study embodiment? Together, how might we imagine the future of immersive and embodied technologies? How might we deploy these across our curricula? Participants introduce their research interests and explore Google Cardboard in small groups. 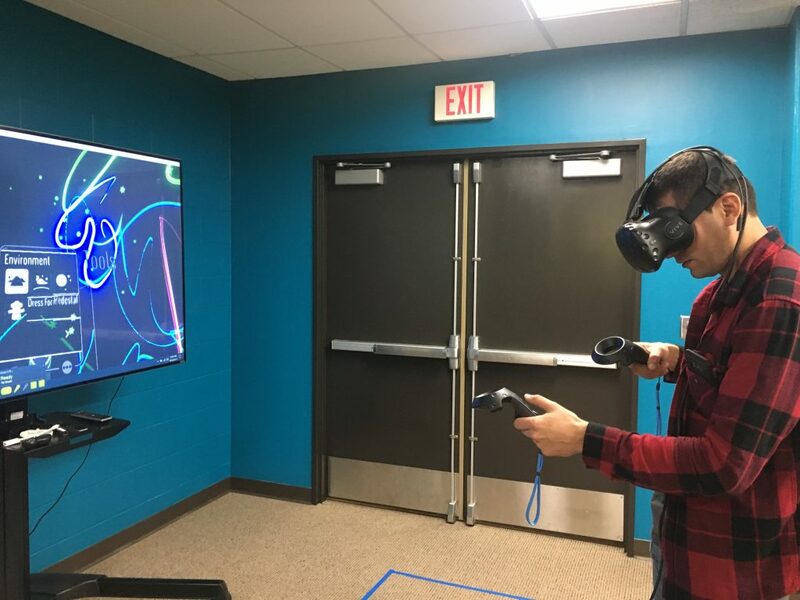 A participant explores a HTC Vive. 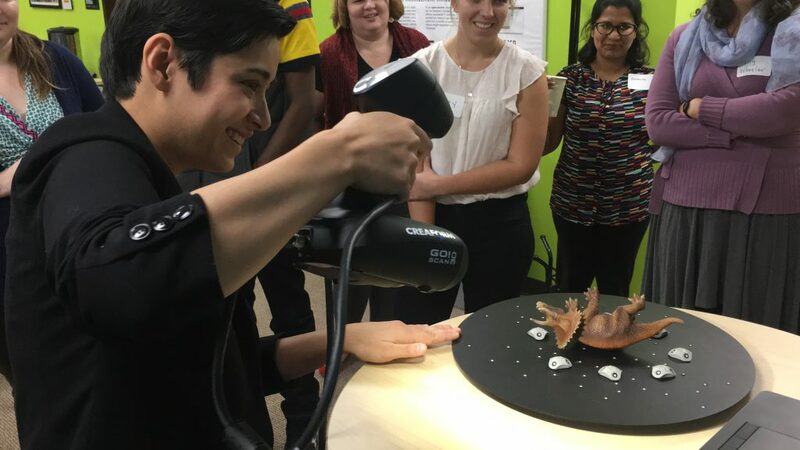 Digital preservation specialist Sam Porter demonstrates 3D imaging of a triceratops. In experimenting with and reflecting upon these issues, I became fascinated by the implications of extra-sensory perception: as we project the physical self into virtual space, the wearable devices become an extension or complication of the body. As we re-negotiate our presence in relation to and in mediation with each device, we can reconceive embodiment; in essence, we “technologize” ourselves through immersion in digital environments. The interface between the physical and the virtual is especially intriguing: one participant suggested that the transitional times when entering and leaving the virtual space, such as the periods of readjustment and recalibration to one’s environment, function as a form of ‘third space,’ a liminal, interstitial boundary or threshold that separates and yet enjoins the ‘self’ and the ‘other.’ In the article on wearable composing cited below, Joe Moses conceptualizes this wearable ‘third space’ as one that “complicates the boundaries between the virtual and the real.” Within this space, we become liberated to transcend the binaries and dualism between the mental and the material, the real and the representational. As I interacted with others to discover ways to employ the devices – how to ask Google Glass to take a picture and navigate between screens, how to construct the Google Cardboard headset – an ongoing experimentation emerged. 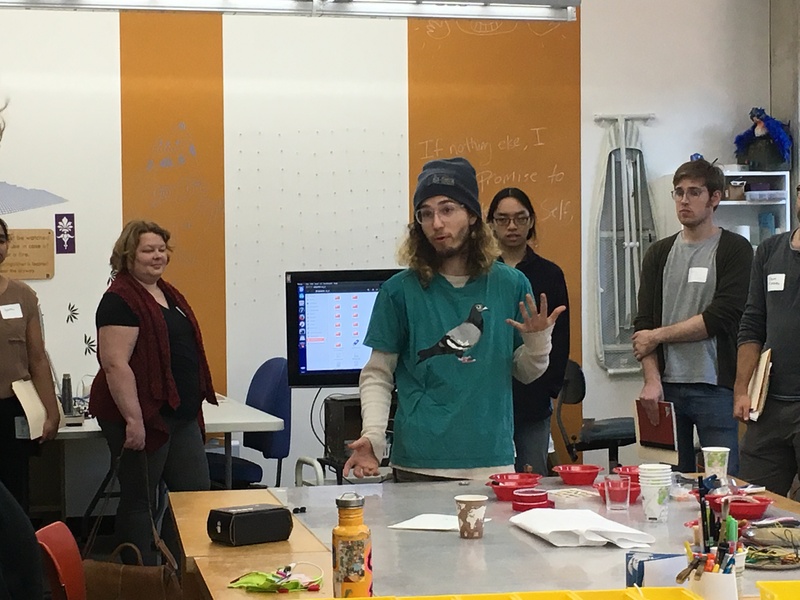 As my group experimented with Google Glass, we considered ways to employ Glass to transform the think-aloud protocol in the composing process, as students’ bodies, voices, and movements can be captured and recorded through the literal lens of the glass. Yet beyond animating the cognitive and affective domains, immersion in virtual interfaces often produces unsettling visceral responses: I encountered instances of discomfort and disorientation as I placed the Google Glass too closely to the eye; I delved into dizzying, destabilizing depths while peering into the Theta 360 degree cameras. In these ways, inhabiting the digital dimension at once invites agency and alterity. 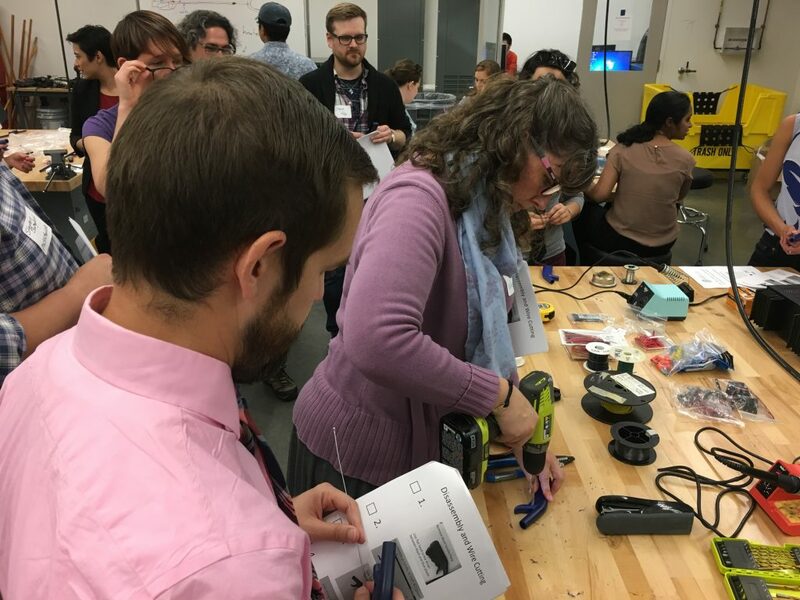 Furthermore, workshop leaders shared the significance of integrating embodied technologies as ways to encourage critical thinking, consider issues of accessibility, and stimulate interdisciplinary collaboration. Members of the Wearables Research Collaboratory, Ann Hill Duin, Joe Moses, Megan McGrath, and Jason Tham, raised awareness of the rhetorical and pedagogical implications of embodied technology, as articulated in the paper “Wearable Computing, Wearable Composing: New Dimensions in the Composition Pedagogy.” Samantha Porter, a graduate student in anthropology and digital preservation specialist, discussed the affordances of incorporating 3D scanners into scholarship across disciplines, especially in relation to anthropology, which bridges technologies ancient and contemporary, past and future, ‘old’ and ‘new.’ Phil Kragnes, Disability Resource Center, reflected upon the need to attend to inclusive design, to provide accessibility in visual, auditory, spatial, and kinesthetic modalities. 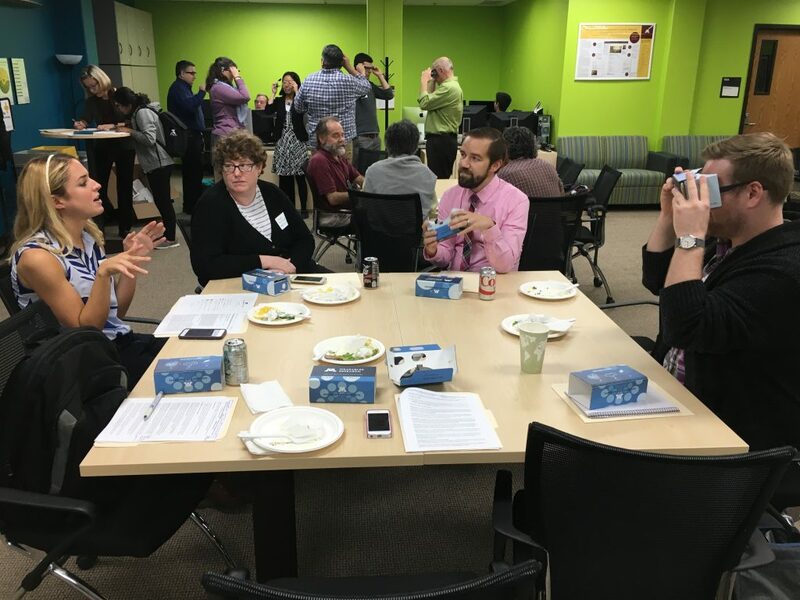 Finally, as Lee-Ann Kastman Breuch, Chair of the Writing Studies Department, alluded to in her welcome, the workshop coincided with the National Day on Writing (NCTE), a fitting spatial-temporal intersection of composition and technology. Following the first session, we traversed the campus environs to discover a second space: the eStudio in the Regis Center for the arts. As director Diane Willow writes, the eStudio serves as a “catalyst for digital dialogues that explore creative processes connecting tangible materials in hand, digital modes of fabrication, and programmable machines,” and moreover, “positions the arts at the center of interdisciplinary collaborations.” As in the wearable technologies of the earlier session, the interface between the ‘tangible’ and the ‘digital,’ the ‘physical’ and the ‘virtual,’ emerges as a salient issue. The materials and machines situated in and scattered across the studio space invite multisensory and extrasensory perceptions, combining the visible, sonic, and tactile modes. A student worker in the eStudio explains the studio’s objective. Participants explore smart fabricating tools in the eStudio. 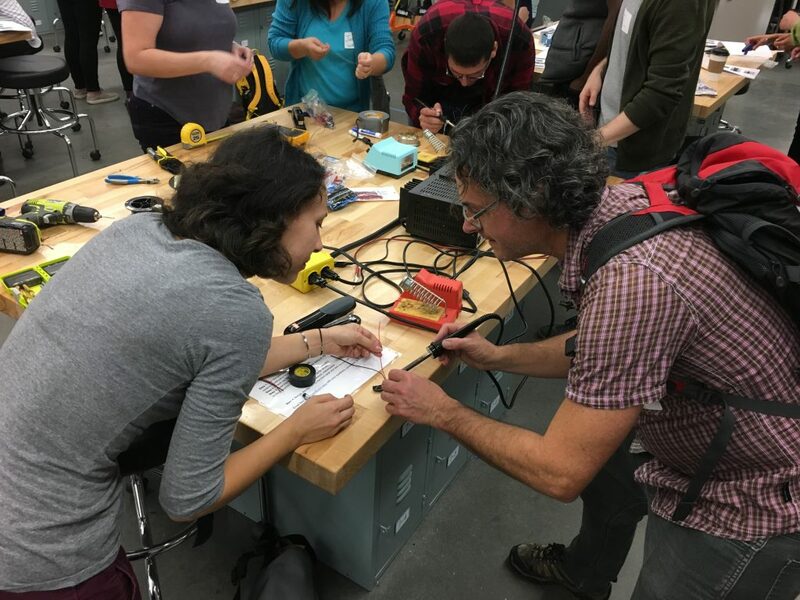 Collaborating with fellow participants, I sought to connect circuits to brighten or dim lighting and create sound effects, and to infer the purposes and uses of a glove that lights up as one closes one’s fingers into a fist. Our collaborations created a ‘meeting of minds’ in a shared space as we navigated the processes of co-constructing meaning and discovering knowledge through experimentation and inquiry. In an apt metaphor for the activity, participants created connections between circuits by holding hands and forming a circle, as every ‘body’s’ energy and electricity synchronized with the electrical energy of the programmed circuits, fusing animate beings and inanimate objects. 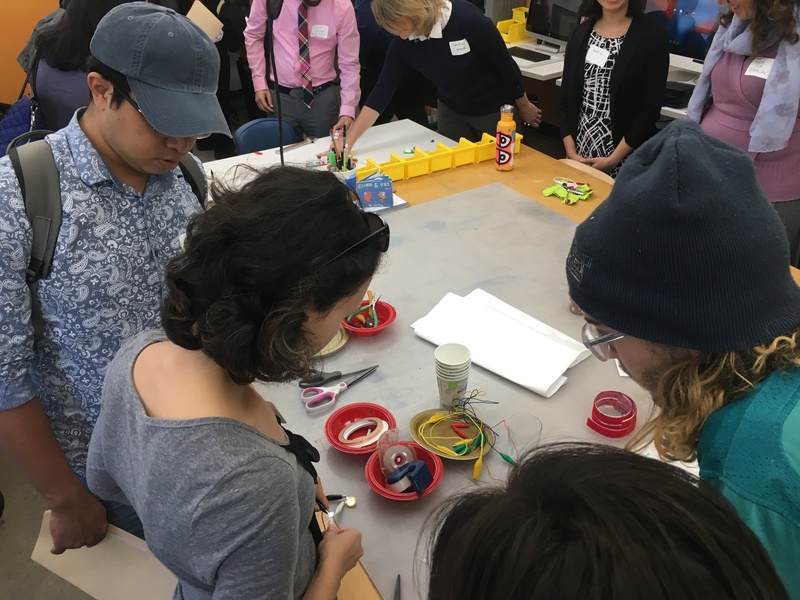 In the third and final session, participants again transgressed disciplinary boundaries and physical campus spaces to encounter a ‘third space,’ in both literal and figurative senses of the term, this time in the Design of Active Materials and Structures Laboratory in the Mechanical Engineering department. Under the direction and guidance of Julianna Abel along with graduate assistants, participants designed gripping devices assisted by shape memory alloys, “an emerging smart material that converts a change in temperature to mechanical work.” Even as groups interacted with each other to ask questions, clarify instructions, and learn by observing each other’s work, the embodied, tactile tasks exposed us to risks and rewards beyond the relative safety of traditional composition pedagogies: using a screwdriver, drilling a hole, cutting a string. My limited skills and coordination, coupled with my confusion with concepts behind the design activity, characterized a disciplinary disorientation not dissimilar from the visceral responses to virtual realities in LATIS or the experimentations with programmed circuits in the eStudio. 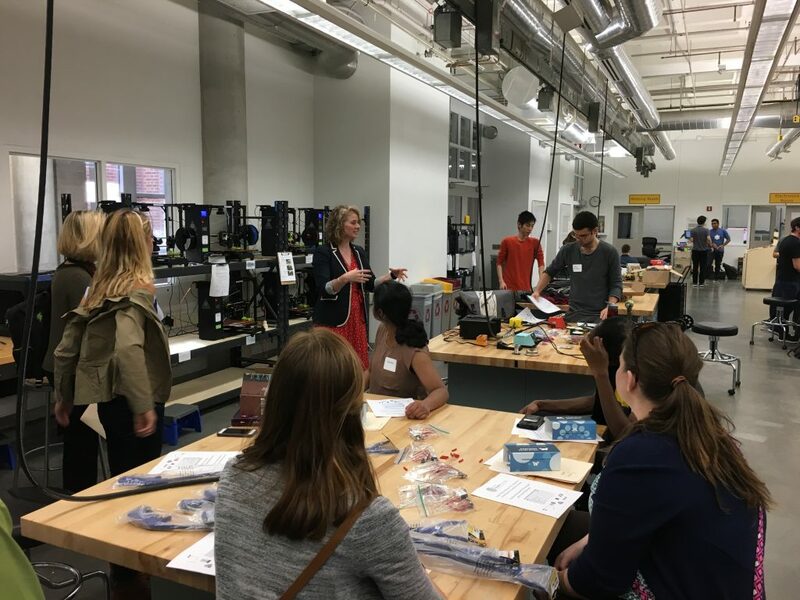 Dr. Julianna Abel introduces participants to the Anderson Lab makerspace and the hands-on exercise. A participant uses a hand drill in the prototyping exercise. Participants help one another to solve technical issues in the prototyping activity. Participants collaborate to resolve technical issues in the prototyping activity. For me, the interstices of liminality proved provocative, yet dangerous: in one instance, I lost control of the power drill and bruised my finger. With a few days’ distance from the activity, however, I now realize that what I termed ‘hands-on humanities’ as I haphazardly handled the materials could be more aptly rephrased as ‘hands-on interdisciplinary collaborations,’ a charge to conceptualize composition as not only theoretical, but applied, and not only humanistic, but as artistic and scientific as well. In one sense, to enter a ‘third space’ is to encounter risks and face challenges beyond one’s comfort; to confront alterity and alienation with open, active arms; to embrace the liberations and limitations of liminality. In our transition from observation and exploration to participation and co-construction, we as participants began to navigate the hybrid identities of composers and creators of processes and products that span multiple disciplines, inspired by these cross-disciplinary pollinations. To conclude constructions yet continue conversations, we crossed the campus once again to a reception on the terrace of the student union. In this fourth space of reflection, in the relative silences and rest from activity, we joined as members of various institutions to take in the view of the collegiate environment, in its sprawling beauty and ivy-covered academic buildings. From this broader perspective and higher vantage point, one that brought to literal light the connections and commonalities among campus spaces, arose the insights that interdisciplinary and inter-institutional collaboration invites ideation and imagination, yet constitutes co-construction and communication as we initiate intersections, reconceptualize realities, and create communities for transforming composition pedagogy through technology. Our interactions during the sessions became agentive and animated as we encountered and navigated interfaces not only between the tangible and the digital, but between the individual and the communal. In the spirit of the pre-conference event’s goals, I hope that we can “spur inter-institutional collaboration as we imagine the future of embodied technologies and the critical, cultural, and creative imaginaries they evoke.” In essence, the pre-conference workshops opened up new, less explored avenues for envisioning and implementing the possibilities and potentialities of creating spaces in which we can expand conceptions and construct innovative knowledge at the intersections of embodiment and multimodality, materiality and virtuality, art and science, self and world. 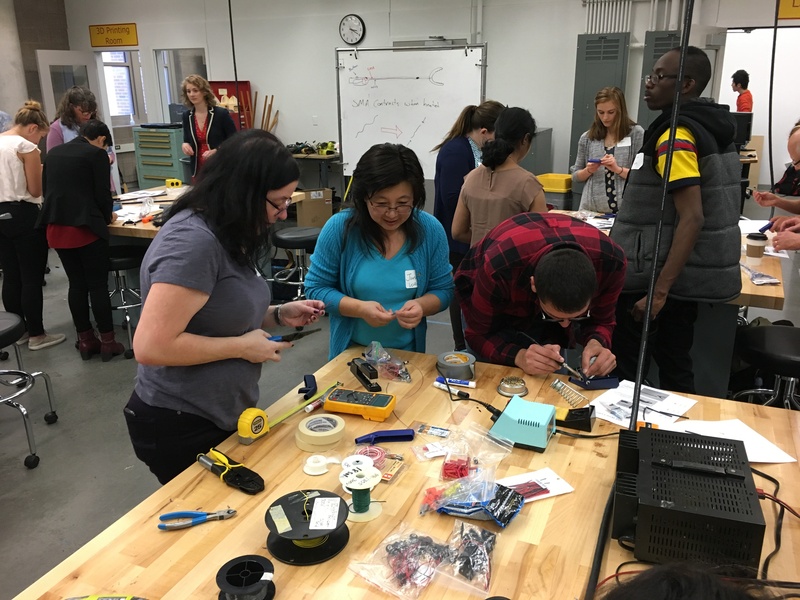 “Exploring Embodied Technologies: Interdisciplinary Collaborative Workshop.” Conference program, Great Plains Alliance for Computers & Writing Pre-Conference Event, October 20, 2017. Duin, A., Moses, J., McGrath, M. & Tham, J. (2016). “Wearable computing, wearable composing: New dimensions in composition pedagogy.” Computers and Composition Online. Photographs contributed by Jason Tham. Ruth Li is a Ph.D. student in the Joint Program in English and Education at the University of Michigan, Ann Arbor. Her research focuses on college students' writing development, composition pedagogy, and digital literacies and rhetorics. Thanks for this engaging account of a memorable day, Ruth. Thank you! It was an inspiring experience.